I love the rhythmic gameplay of Crypt of the Necrodancer. I was glued to my Switch once it released last February. 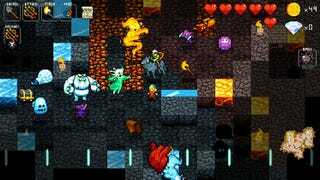 With laser focus, I danced through its clever design and roguelike dungeons. Then I quit right after getting destroyed by the game’s titular boss. I had spent days and hours learning enemies’ attacks, failing miserably, managing fleeting victories (to later be trounced), and enjoying my time. And yet, the effort to complete it is too much right now. I haven’t been as good about finishing my games for the past few years with the 2015 rhythm, roguelike game being my latest victim. In Necrodancer’s case, I was satisfied that I had finally made it past a certain point after trying so many times. I made that my goal. I then moved on to whatever game was next, and I’m okay with that. I may actually go back and finish that someday. That’s a constant line I feed myself for all my unfinished games, and sometimes it’s a truth! Even if it takes me months, and in some cases, a couple of years. When I asked Kotaku’s reader-run community, TAY, a few weeks ago to give me the games they last abandoned, I got some interesting responses. I’m always curious as to why I’m not finishing my games, and finding out same from others. As there are so many games out there seeking our attention, what are our personal standards for what’s a must-play to completion? And so now, I turn the question to you, dear Kotaku readers: What’s the last game you abandoned, and why? Will you go back? Did you regret getting it? Let’s chat!